As I left the house this evening to run to an esoteric shop, I thought briefly on tarot cards. 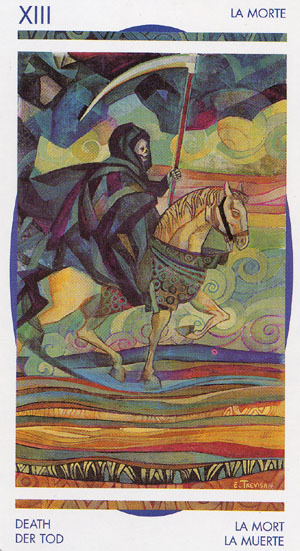 With my last post being a discussion of transition, I flashed on the Death card—transition, change, the end of one cycle and the beginning of another. However, my mind soon shifted. 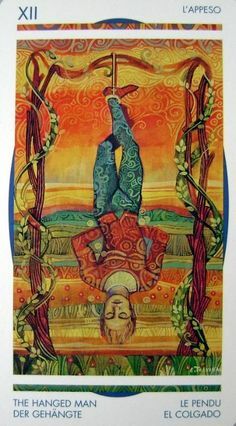 I thought, “Right now, the Hanged Man is more important for me.” This card has come up for me in key positions in my self-readings of late. I walked up the hill toward the shop and mulled this card over some more. The personal sacrifice of Arcana XII, the Hanged Man, comes before the great transition of XIII, Death. In the transitions I have been facing, I feel hanged, sacrificed, but not through my own choice. I too dangle by one foot, uncomfortably immobilized while the entire world seems upside down. If the sacrifice here is supposed to lead to spiritual salvation and transformation, some deeper realization or enlightenment, I have yet to see what exactly it is. I hang, watch, and wait—pending. Hanging here through sacrifice, yet it is not in vain. I got to the shop, and there was a Death card on the board by the register. All things must end, and yet, “omnia mutantur nihil interit”.